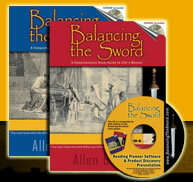 Balancing the Sword Includes Writing Space for You to Journal Your Notes, Prayers, etc. Undoubtedly, powerful devotional times will bestir your desire to journalize insights. So, there is a place for your own questions, comments, and notes. As you complete the various sections, your cherished prayer journal and study note will amass.